The fishing season is fast approaching and we’re all busy getting ready for what is shaping up to be a great year. A little less than two months until regular season starts on June 13th and we are looking forward to seeing everyone this summer, and of course… fishing. A lot of exciting events coming down the pipe, with two pre-season fishing derbies, some fresh renos in the resort and the fishing reports look amazing for the season. We just wrapped up our tradeshow circuit, making stops in Puyallup, WA, Victoria, BC, Abbotsford, BC and Edmonton, AB. We met and talked to a ton of new guests who we will be seeing soon at the resort, as well as a few familiar faces. We had our new Office Manager/Guest Services Supervisor, Samantha join us for two of the shows. You may recognize her from last season in a Guest Services role, we’re lucky to have her back for round two! If you were thinking about booking for the upcoming fishing season, now is the time to make your move! The summer is filling up quickly and we have limited dates left. The best thing about being located in Barkley Sound is that fishing is amazing all summer long. In June, many Chinook salmon are in the 25 to 35 pound range. Because these Chinook are preparing for their spawning runs, they avidly attack herring and your fishing lures! Halibut show up in big numbers to feed on the same bait fish, both in Barkley Sound and the offshore rock piles. In July, local salmon begin to show in ever-increasing numbers in the Sound. Some halibut will remain in Barkley Sound, but most will move to the offshore banks and rock piles. In August, salmon fishing explodes as Coho salmon in great numbers join the mix. If you’re wondering how to get to Eagle Nook Resort, get directions here. And if you want to reach out with some questions, our contact info is here. Here we go, 2019! Here’s to making this season full of fish, good company and lots of fun. So you want to can your own salmon? Picture this: you’ve spent two full days out on the Pacific Ocean catching tons of salmon and now you don’t know what to do with it all! 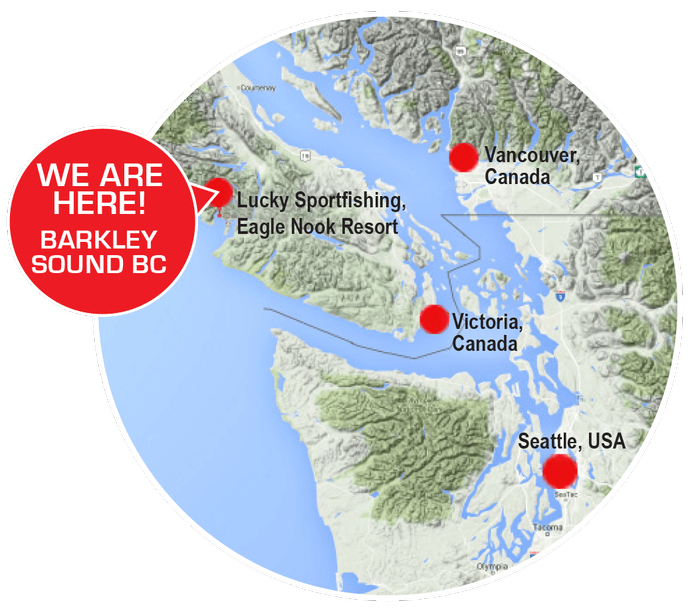 It’s every fisherman’s dream, and one that is made easier to achieve with a chartered salmon fishing trip with Eagle Nook Resort in Barkley Sound on the west coast of Vancouver Island, British Columbia, Canada. If freezing all that fish you caught isn’t a possibility, then one option is to try canning your salmon so you can enjoy it days, weeks, or even months down the road. Here is a step by step guide to canning your own salmon using a pressure canner. For best results, some prior experience using a pressure canner is recommended. This method of food preservation often takes some trial and error – and we would hate to see your precious fresh catch of the day gone to waste! So, if you’re up for the challenge, here’s how to make canned salmon at home. Start by preparing and assembling your 250ml or 500ml canning jars. (Do not use 1L jars or the fish won’t process properly or safely.) You can expect to get anywhere from three to six pints per fish, depending on the size of your catch. To prepare the jars, clean them in hot soapy water and rinse them well. Ensure the jars are cooled off before you fill them. The jars don’t need to be sterilized, just clean. The pressure canner will take care of the sterilizing. Toss the lid rings to the side for now but soak the snap lids in hot water until ready to use. Thoroughly clean your chilled salmon after removing its head, tail, fins, most of its scales, and all traces of blood. You can choose whether to remove the skin and bones as well. Left in, however, the bones will soften during the canning process if you add vinegar. Cut the fish into large enough steaks using a meat cleaver or similar so that you have about one big piece per jar. Fill the jars with the prepared salmon leaving as few air gaps as possible, but leave about 1 inch (2.5 cm) of space from the top of the rim. Remove any air bubbles with a wooden or plastic spoon or other type of non-metallic utensil. If you’ve left the skin on, you can place the fish skin side in, or skin side out, keeping in mind that concealing the skin can result in more attractive jars if you plan on gifting any of your canned salmon. Add the optional pickling salt and vinegar to your salmon. Use half a teaspoon of pickling salt per 250ml jar, or a full teaspoon of pickling salt per 500ml jar. Never use table salt! You can also choose to add the optional vinegar if desired to soften the bones. Simply use the same measurements as the salt: half teaspoons for half pints, and full teaspoons for full pints. With your jars now filled, wipe each rim clean with a paper towel dipped in vinegar to remove any salmon oil from the rims. Neglecting to clean your rims can lead to unsuccessful seals, so don’t skip this step. Add the snap lids to the jars and then screw the rings on until finger-tight (do not overtighten). Place the jars on the racks of the canner, leaving enough space for steam to flow around all the jars. If you’re stacking jars, add a rack between layers. Add the required amount of room temperature water as per your pressure canner’s instruction manual. If you have hard water, a small amount of vinegar can help prevent the water from leaving a white residue on your jars. Lock the pressure canner lid in place. Processing times and appropriate pressures for canned salmon vary by your altitude and the size and style of your canner. In general, for 250ml or 500ml jars in a weighted gauge pressure canner at an altitude of 1,000 ft should be processed for 100 minutes at 10 lb (69 kPa). For dial gauge pressure canners, or when canning at higher elevations, the pressure needs to be adjusted. Consult the chart in your canner’s manual. If you have a vent canner, allow the canner to vent for 7-10 minutes, following the directions for your brand of pressure canner. Once your processing time is complete, turn off the heat and leave the canner alone until the pressure has dropped back to zero and two to three minutes have passed. Carefully remove the lid angled away from you to avoid any steam. Keep jars level as you’re removing them. Leave the jars to cool for 24 hours, without adjusting or retightening the screw bands. After 24 hours have passed, check to see if your jars have successfully sealed. (Discs will be curved downwards). Remove the screw bands and fully wipe dry the jars and bands. You can leave the rings off or clean them and add them back on. Add labels, including the date, to your homemade canned salmon and consume within one year. Although canning your own salmon can definitely be an experience, sometimes it’s nice to let someone else take care of everything for you. And that’s what you get at Eagle Nook Resort. Not only will we do everything we can to make sure you catch your limit of fish each day but our staff will also clean your fish, freeze it and pack it proper so you can take it back home in perfectly sealed, frozen packets. Here at Eagle Nook Resort our world-class salmon fishing charters come with everything you need to catch enough salmon for the entire family. Learn more about our all-inclusive chartered fishing excursions on Vancouver Island, Canada. Wow, can’t believe how quickly June has snuck up on us. We are gearing up for what looks like is going to be an excellent and busy season. With our opening weekend on June 14th, we have been busy getting the resort up and ready. We have managed to have a bit of pre-season fun, with our Luckysportfishing Derby last weekend and our Eagle Nook Derby, going on right now. Besides our fantastic staff team already up here, we have also have some incredible groups of people coming up to help us out. John Ferraira, John Hill, Steve and Rick Gordon, who have over 135 years of gardening expertise, working at one of the islands most famous gardens, came up to help us set up all our flowers and landscaping. This year we brought in a whole bunch of new swag in our gift shop. Jan and Danielle were rockstars, setting it all up for us this year. We have hats, jackets, t-shirts, long sleeved and some artwork and jewelry, we have something for the whole family or a little souvenir to take home to remind you of your time up at the resort. Thanks to all the guests who made it out to participate in our annual derby. There was lots of fun had and plenty of Salmon caught. It was a close race to take home the trophy this year. A big congratulations to Reklyne for reeling in the Derby Winner at 22 pounds. In a very close second, Scott Munro and his team reeled in a 21.8 pound Salmon, and just behind them in third with a 21.6 pound Salmon, “Jeff” and his crew. In typical west coast fashion, the Eagle Nook Derby has started off a little bit soggy. None the less, that isn’t stopping them from getting out there to find the big Salmons and bring home the $5,000 derby prize. Julia Raedar is back this year, hoping to defend her title. But she has got some competition with many eager guests hoping to take home the prize and bragging rights. While opening weekend is just around the corner, there is still plenty of time to come and visit us here this summer. We have some space still available in July and the beginning of August. So what are you waiting for? Come and see us and we will send you home with not only great memories but hopefully also have you reeling in some prize worthy salmon. We hope to see you this summer!! The team at Eagle Nook.